From Medicom. 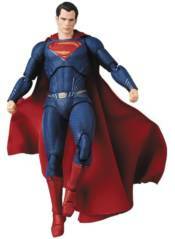 Based on his appearance in Justice League, here's MAFEX Superman! About 6' tall and highly articulated for action poses, the Man of Steel has been carefully sculpted to reproduce the texture on his suit, and he has a fabric cape, interchangeable hands and two interchangeable faces, too. A figure stand is also included. Add this most iconic of superheroes to your lineup today!